February 26th, 2017 – Rev. Canon Dr. William J. Danaher Jr. When I was 14 years old, I went to a nice school and it had a beautiful library, and I kind of discovered this library. I was from a small town in Connecticut and going off into that library was like this incredible moment to encounter a wider world, and to see this wider world that surrounded me was waiting for me to investigate and explore myself. There were two periodicals that I would draw upon, and spend hours reading them, and seeing this greater world. One was Life magazine. And Life magazine had these compendiums as well that I would spend hours looking at the pictures. Life magazine had compendiums like Life Goes to the Movies, and you would see a kind of photo montage of the beginning of film with people like Charlie Chaplin and then the “starlets of today.” It was an older piece. We don’t usually use the term starlets anymore, but they were there. And Life Goes to War in which you would see early pictures of our soldiers, some of them lying dead, having given everything. And then more recent pictures in which the world becomes a little more complicated but still hopeful. The second periodical was the National Geographic. I loved the National Geographic. It was amazing. I got it all the way through college. One time I actually put on my resume “Member of the National Geographic Society” when they said professional affiliations. I had no other to claim so I claimed that. I love the fact that I was in some ways a member in this incredible society that wanted to span the globe and lift up human life in all of its variety, in all of its diversity. There is probably something wonderful and hopeful in those two periodicals. Life magazine was founded by Henry Luce who was the son of missionaries in China. The vision so one biographer has written of Life magazine was to somehow see the whole world and to see it as all in some ways unified, whole, complete, and beautiful. A kind of vision of the Kingdom of God, if you will, rendered in pictures. One image that really struck me, I saw it in 1984, was in the National Geographic. This was during the height of the Cold War when you had all of these incredible demonstrations by the Soviet Union of how incredibly powerful they were. They had weightlifters who were stronger than anybody else for years upon years. They had these incredible athletes who run bare-chested into frozen rivers, and that was, I guess, meant to intimidate us, to tell us that we couldn’t keep up. But one picture I discovered in the National Geographic really struck me, and it was of these sunbathers by the Fortress of St. Peter and St. Paul on the Neva River. The sunbathers had gone in the dead of winter and had unzipped their parkas and were holding them open so that they could get as much sun on their body as possible. I was so taken by that in part because the women had actually taken off their blouses, and I could actually see their undergarments, which looked like they had been fabricated in a tank factory and were just as impermeable as the armor of those tanks. But to a 14-year-old boy, that was an exciting moment. So where I was, the National Geographic was as close as you were going to get to anything like that, and I found that kind of intriguing. But what really blew my mind was the fact that they were all opening themselves up to the sunlight, that the sun felt so good. And the caption said it was minus 10 degrees when they had chosen to unzip their parkas and to let the light shine on them. I had this weird moment, this kind of revelation, at 14 years old, that sunlight was this incredible thing that we all shared. That despite the deep divisions between our two countries, despite the fact that there was this ideological struggle, despite the fact that there was this incredible proxy wars and cold wars going on, that the sunlight shining on them – the fact that they wanted to have the sun shine on them, too, well, that was kind of a revelation. Because no one can colonize the sun and light shines no matter where we are standing when it’s a sunny day. Light is not a respecter, in other words, of territorial boundaries. It shines on us when it shines. I had this moment of revelation that we could be such a different world community if we could all unzip our parkas and become a bit more vulnerable and let the light shine on us. What does it mean to let light shine on you? What kind of protection are you wearing? So many of us go through our days, I think, protected, and to become vulnerable in that way, to admit that we need light just like any other house plant, it’s a stunning thing. And of course, by this, I mean not only physical light, the kind of light that you can see or understand through particle or wave theory, I mean metaphysical light. I mean moral light. I mean spiritual light. In what ways might we be transformed if we could unzip the parkas, the protections we have on our lives, and let the sun strike us and warm us and change us and renew us? Today, we celebrate the Feast of the Epiphany. This is the feast day in which we celebrate a moment in Jesus’ ministry in which just before He is betrayed, mocked, and crucified, and then rises from the dead – before He goes through all of that passion, there is this moment on a mountain in which Jesus is changed. In which light shines from Him and that His clothes become dazzling white. In our reading from 2 Peter, there is this moment in which we are told that this is not a mythological moment. This is not a moment that has been made up of Jesus. Peter writes that he believes that this was a moment that he witnessed. We do not believe in cleverly devised myths we read, but we are witnesses, and it’s to the light that Peter testifies. Everything that happens in the gospel that we read for today, and you see it in Luke and Mark, is meant to convey to us an incredible, powerful point: that Jesus is the light of the world. In our first reading from Exodus, there is a moment in which Moses goes up into the mountain to see God and he receives, beyond clouds which are obscured, the law. And standing behind that is a longstanding theme in religious thought; the God that Moses meets is a God who is hidden from us always, except through the law. The God who is portrayed in Exodus today is the Deus absconditus – the God who is hidden. But in today’s gospel, you have the God who is revealed; the God who is clearly in front of us. Because instead of clouds – even the clouds in our reading from Matthew shine, as it says. But instead of obscurity when the disciples go with Jesus up the mountain, they see light. They see a stunning moment in which all of God’s intentions for God’s people come into this culminating point and light shines from Jesus. And Jesus becomes the law that was once spoken to the people of Israel. Jesus is now our law. Jesus is our life. Jesus is our love. And the pivot point of today’s gospel is another theme that is unique to Christianity and is the most important way in which we can see God and understand God active in our lives. And that is Deus pro nobis – God for us. God for us. God made manifest in Jesus Christ light shining from Him. And the key to this is not merely the light that we read about in the gospel today. It is that incredible moment in which God speaks to the disciples and says, “This is my Son, my beloved.” And that is not just an echo to what happened to Moses thousands of years before when he went up the mountain. That’s an echo to the moment in which Jesus is baptized, and there’s a similar revelation that Jesus is God’s beloved. And the wonder of wonders and the good news for you and me is that we are beloved too because we have been found in Jesus. That incredible title of being God’s beloved. That incredible title given to Christ has been shared with us. And one of the earliest terms for Christians that Paul uses in other parts of the New Testament is to call them the beloved because they had been found in Christ. Because the Jesus who was revealed on that mountain, and then went and died for them, had made it so, through His resurrection, that they would be found in Christ as God’s beloved too. All of this is incredibly important, which is why the Eastern Orthodox say that the transfiguration is the most important feast day in the church. Because it is in that moment in which you see light coming from Christ that you begin to see your own place in the world, which is to walk in that light, to shine with that light, through the power of the spirit. But it’s not just the Eastern Orthodox who see this. Over the past couple of weeks I’ve been reading and reflecting on a great mystic and civil rights activist named Howard Thurman, an African American educator. He writes that the most important thing that anybody could ever be told, the news that will lift someone up and help them see themselves as no longer oppressed, that will liberate them to live their lives powerfully and with dignity is the simple understanding that they are God’s beloved. That they are beloved by God. That they are God’s children. And once that news, that information, that witness is completely internalized, there is nothing that could happen that could take that assurance away. And Thurman writes this in 1949 to an African American community that was experiencing incredible oppression, but he means it as a way in which we all might see ourselves as one body, and see ourselves as possession one world, that we would all be beloved. What does it mean for you to step into the light that God is shining in your life from Jesus Christ? What does it mean for you to experience anew what it means to be the beloved of God? What do you need to open up so that the light of Christ can shine upon you? These are the questions we have to answer in Lent. One image of it I’ve given to you is in the art for today. It’s from a Japanese artist. His name is Tokujin Yoshioka. And in 2010, he wanted to construct this incredible piece of light that he patterned off of Henri Matisse’s famous chapel in Vence, France, in which light was so important to that wonderful chapel. For Matisse, he had constructed lifelike, beautiful, bright-colored stained glass windows, and the light would shine through them onto the scenes from the Bible, which were just traced out so that people could see that when the saints of the Bible did anything, that they were not so much doing anything powerful or new or different, but they were simply walking into the light that God created for them. 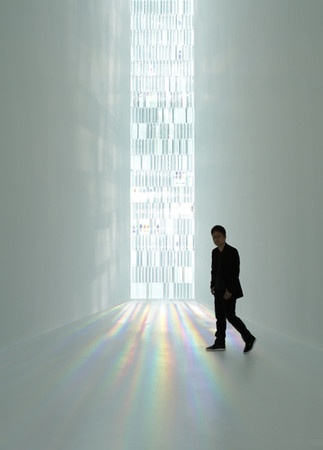 And Yoshioka, instead of painting anything figural, actually constructs this eight-meter tall window full of prisms. By this, he meant to suggest and to challenge our understanding of light, because light is not white, but light is actually a spectrum of colors. The closer that you move towards this window, and the more you are enveloped in the incredible light, the more you begin to see the spectrums play out on the walls around you. The more you see that you are surrounded by color and you have a place within it. Yoshioka, I think, is actually trying to point us upward, to have us see ourselves from a place in which we could see the whole world at once. That is, I think, a powerful witness of what it might mean to see light here and now. But what is your story? What light will you see? What do you need to open up to God? How will you be changed by Jesus? How will you know that you are beloved and that from eternity God considered this day incomplete without each person in this room? These are the questions you and I have to struggle with and wrestle with and mull over in our minds as we go into Lent. Lent is a time of self denial as so many people have said for so many years, and if you want to give up chocolate or go on a diet, that’s just fine. I’m not sure if that will bring you closer to God. I’m certain it will make you feel miserable because I think that when Jesus left that mountain and went and gave Himself for us, He wasn’t engaging in self denial. He was engaging in self realization. He was becoming all of whom God had called Him to be, and that was magnificent. I think this Lent is an opportunity for you to be all that God has called you to be, and that is magnificent. The difference between Jesus and you and me is miniscule, because in this moment what we need to do is not so much give something up but learn to surrender. Amen.